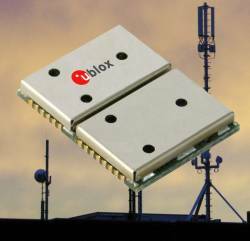 u-blox has released a new low-voltage GPS module — the NEO 5D. Operating at 1.8 volts, the module require 40 percent or more less power compared to its predecessors in the 50-channel u-blox 5 engine product line: 72 mw @ 1.8V in the “Eco” mode and 77 mW @ 1.8V in the “maximum performance” mode. The module comes in a 12x16x2.4-millimeter package and employs u-blox’s SuperSense acquisition and tracking technology with a reported reacquisition and tracking sensitivity down to –160 dBm. Cold-start acquisition sensitivity is -143 dBm with a time to first fix of 32 seconds. The ROM-based architecture does not require an external Flash EPROM, making them suitable for high-volume consumer products. Like all of u-blox’ modules, the new NEO 5D and NEO 5G support u-blox’ AssistNow, the freely available service that reduces the time-to-first-fix to one second by providing satellite ephemeris and almanac position data, as well as accurate time and other satellite information over a mobile network, according to the company. u-blox, Thalwil, Switzerland.